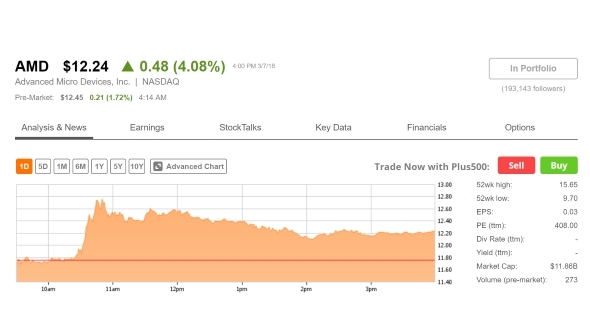 The stock market awoke yesterday morning with rumours swirling around about a potential AMD takeover. It’s a regular refrain, and potentially just based on unsubstantiated rumours deliberately spread to spike share prices, but it still sent AMD stock up by almost $1 per share in less than an hour. So, who the hell is meant to be buying AMD this time? The idea of AMD being bought out by another company is one that periodically gets floated around, with many names getting thrown out, as do accusations of pump and dump share shenanigans. It’s an interesting time to do that with the release of the AMD Ryzen 2 CPUs set to drop very soon. Realistically it’s tricky for AMD to sell out to any other company as they have so many agreements in place that are absolutely vital for them to protect if they want to carry on producing great CPUs and great GPUs. Well… great CPUs anyways. As tempting as it might be to suggest Intel could be the ones to swallow up the plucky upstarts, especially after already grabbing their Vega GPU tech and GPU guru, Raja Koduri, but that way lies monopolies problems, which would end up harming both parties. And we’re a long way past the time when Nvidia would have reasonably eyed up the red team as a prospective purchase to bolster their own x86 ambitions. And there are likely serious reasons why they might not be able to take that x86 license with them if Nvidia did take over. A more reasonable rumour is the idea of a reverse takeover. 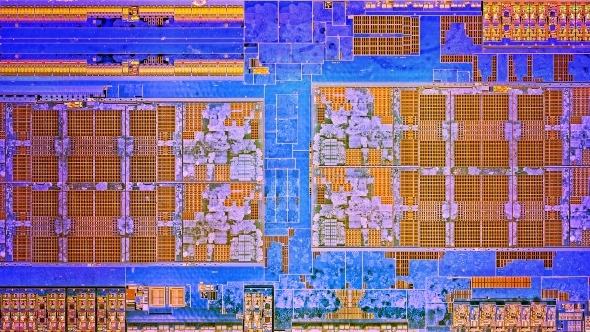 Some industry folk have posited the notion that Xilinx might essentially merge with AMD and help preserve their precious x86 license. Xilinx invented and create the silicon behind field-programmable gate arrays (FPGAs) that are providing an alternative to ASIC mining of the Bitcoin cryptocurrency. With AMD’s support of the GPU side of mining, and an increased interest in what their CPUs can achieve, the idea of them getting into specific mining FPGAs isn’t beyond the pale either. It’s all speculation right now, and likely will come to naught, as have all the previous ‘AMD being taken over by X’ rumours, and as AMD’s share price gets higher, as consumer and investor confidence grows, there’s a chance they become less and less attractive to the buyout crew. Doesn’t stop us from playing fantasy takeover though, so who would you like to see taking over team red? Apple? Samsung? Disney?